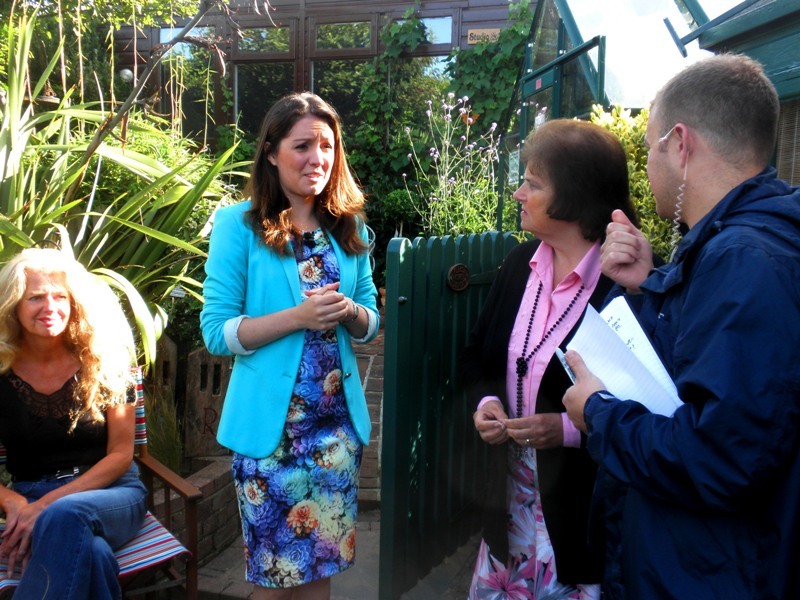 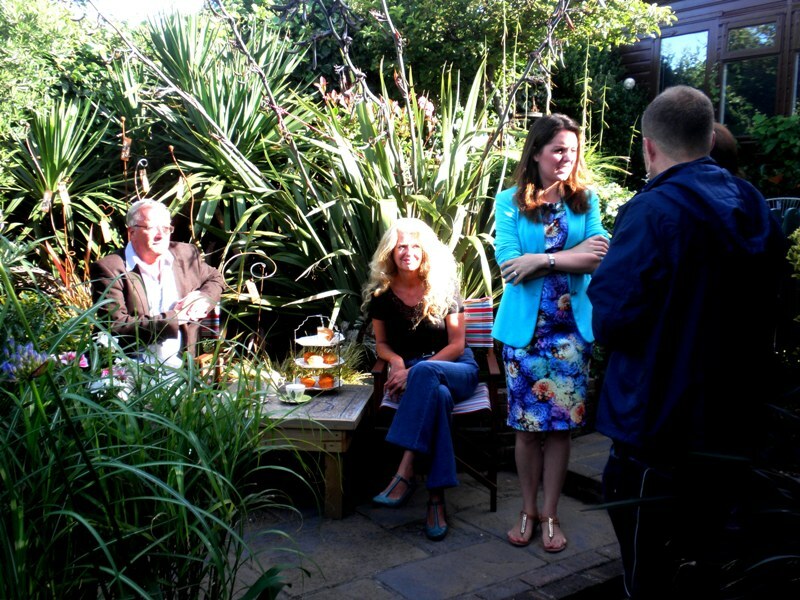 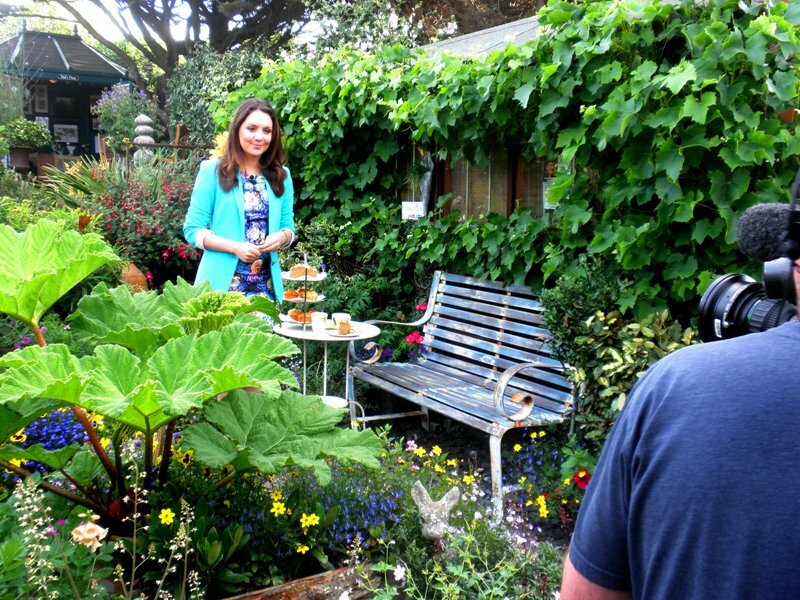 Good Morning Britain's weather girl, Laura Tobin, broadcast her forecasts "live" from the garden on the 14th July 2014, as well as interviewing Geoff on air too. 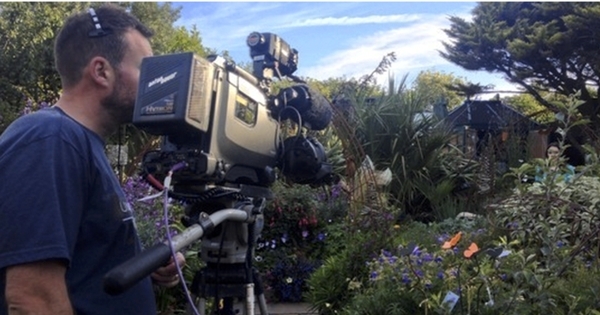 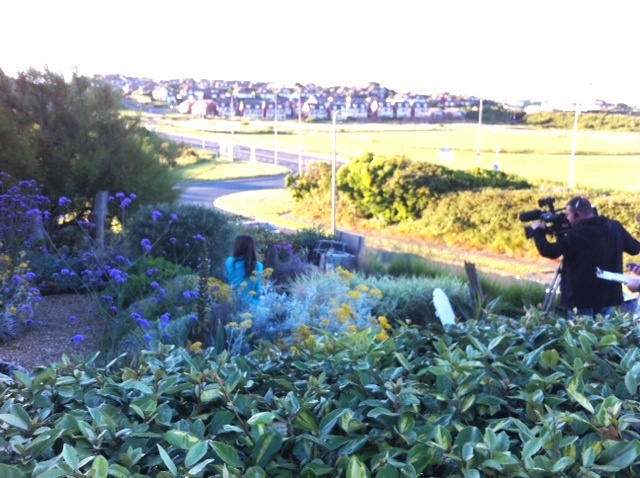 A full production crew were in the garden from 0500 until after the programme had aired at 0930. Read all the details below. 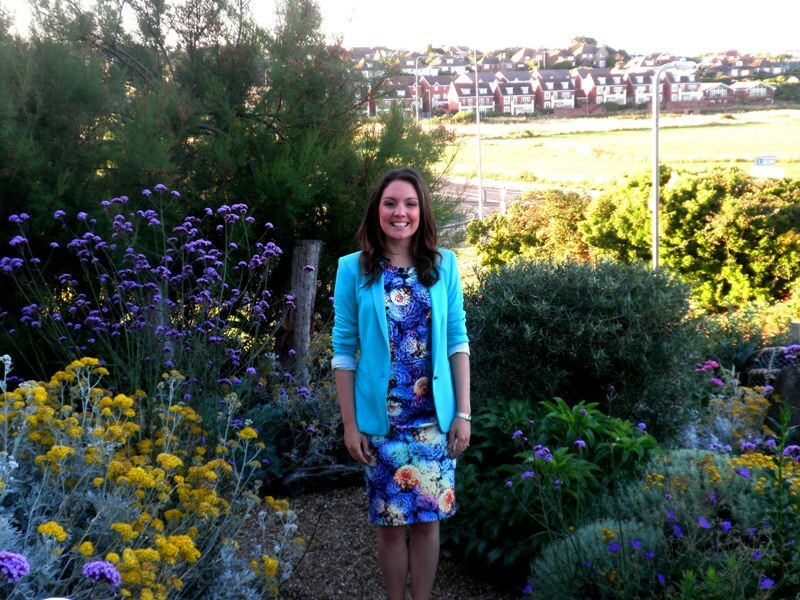 Below, a Happy New Year message on twitter from Laura for 2014. 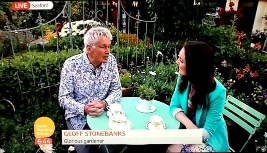 @driftwoodbysea @GMB How time flies. 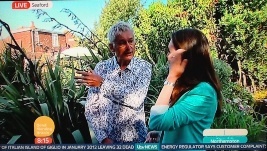 Happy new year to you too. 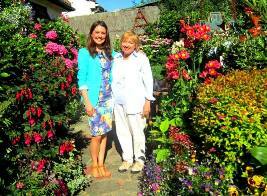 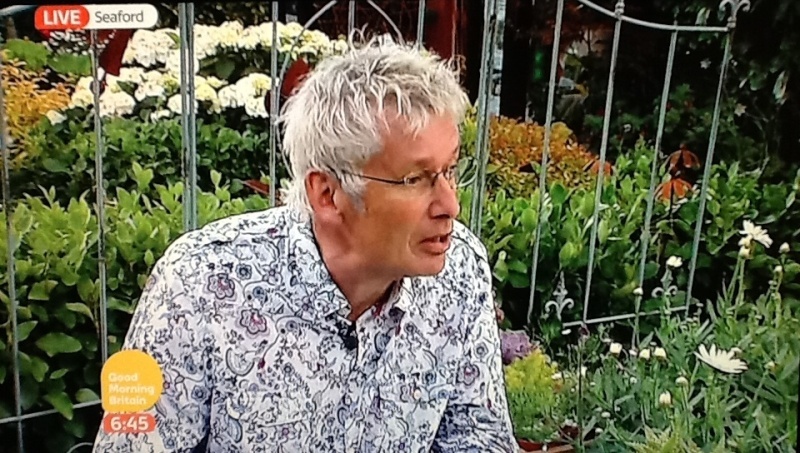 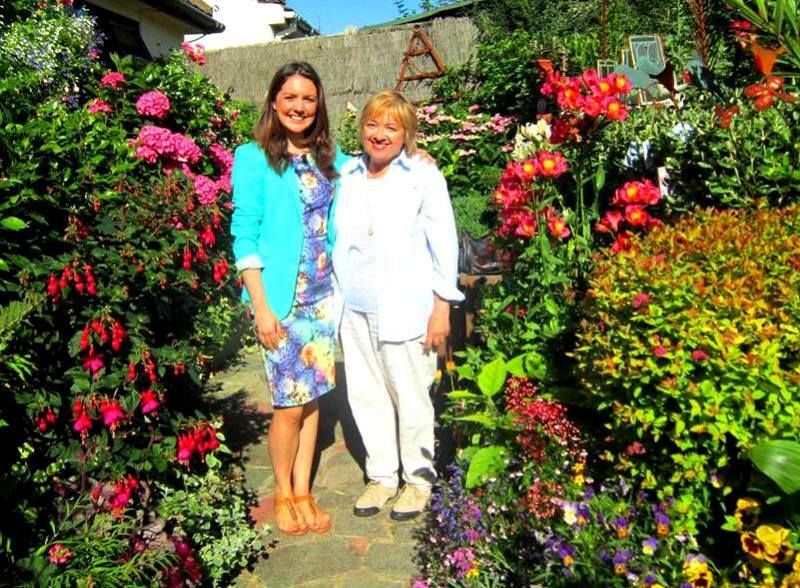 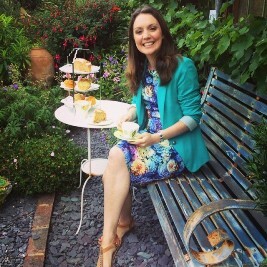 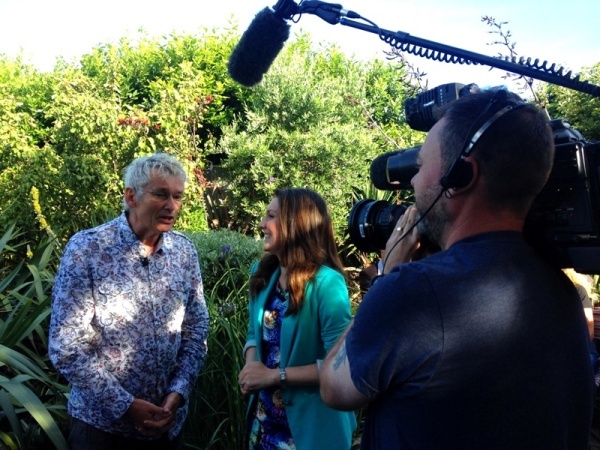 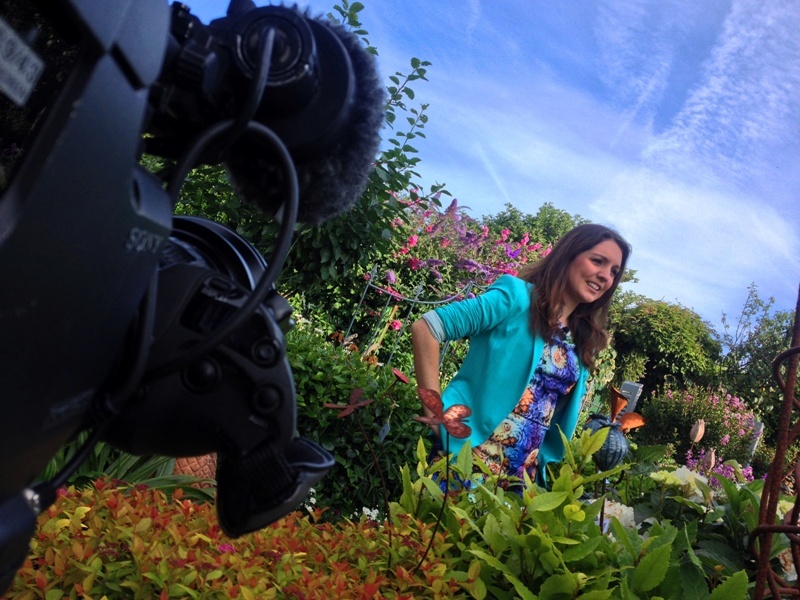 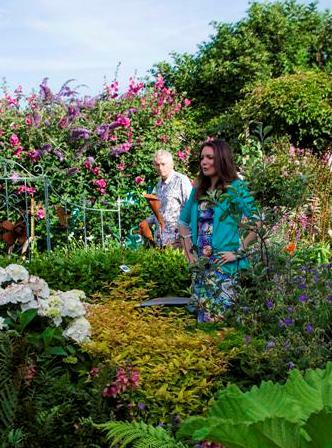 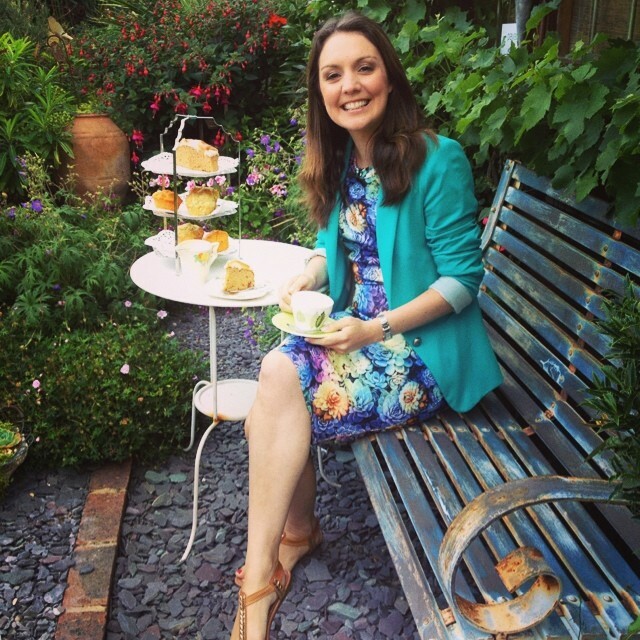 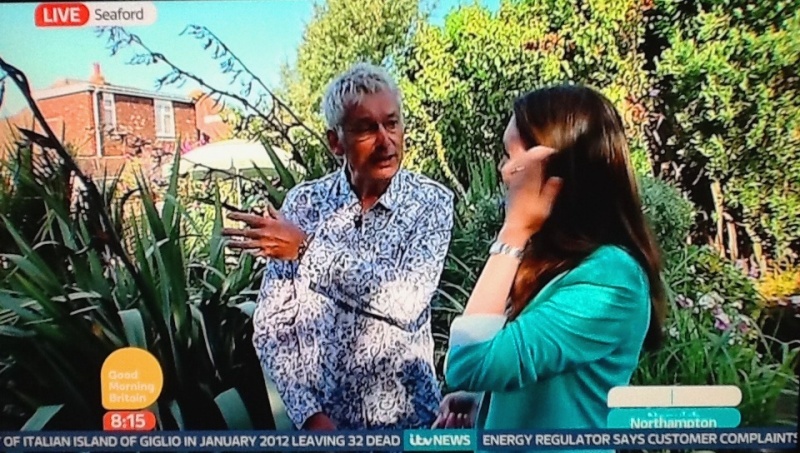 Good Morning Britain gave out a shout on Monday 7th July, inviting garden owners, or friends, to nominate "Glorious Gardens" from which their weather girl, Laura Tobin, could report from "live" week commencing 14th July! 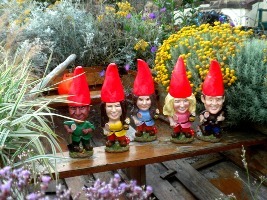 I got in touch with them and this is what happened next! 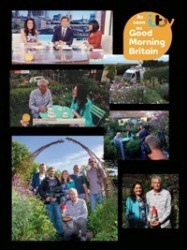 Check out the detail on the Good Morning Britain web site. 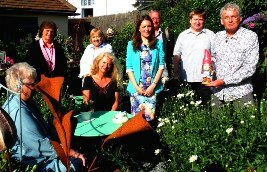 A wonderful on line article appeared in Sussex Express on the 15th July as well. Good Morning Britain posted a wonderful blog about the day at Driftwood on their web site on the 16th July here . Amazingly, I was contacted on Thursday 10th to say we were seriously being considered! 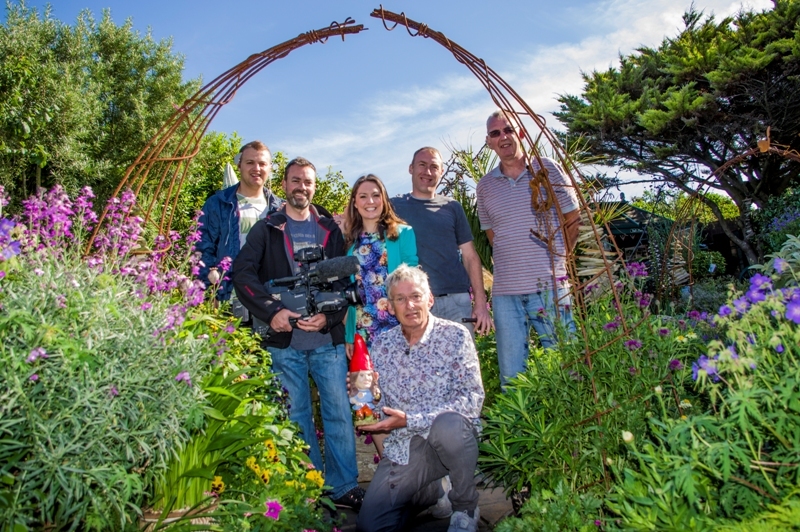 Oliver Breckon, producer of the outside broadcast, rang at 5pm on Friday 11th to confirm that the programme on Monday 14th would indeed have the weather reports filmed "live" in Driftwood with 2 interviews with me "live" on air too! 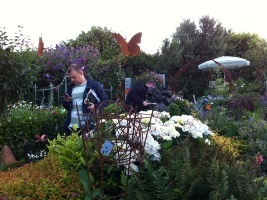 Panic set in trying to get the garden to look the best it possibly could and luckily the weather was on our side! At 730pm on Sunday 13th, Oliver came to the garden to deliver the Good Morning Britain gnomes and to see the garden for himself, which you can see below as they inspected their home for the night! 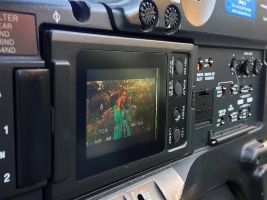 At 4am the next morning the ITN van arrived to transmit the images back to London. 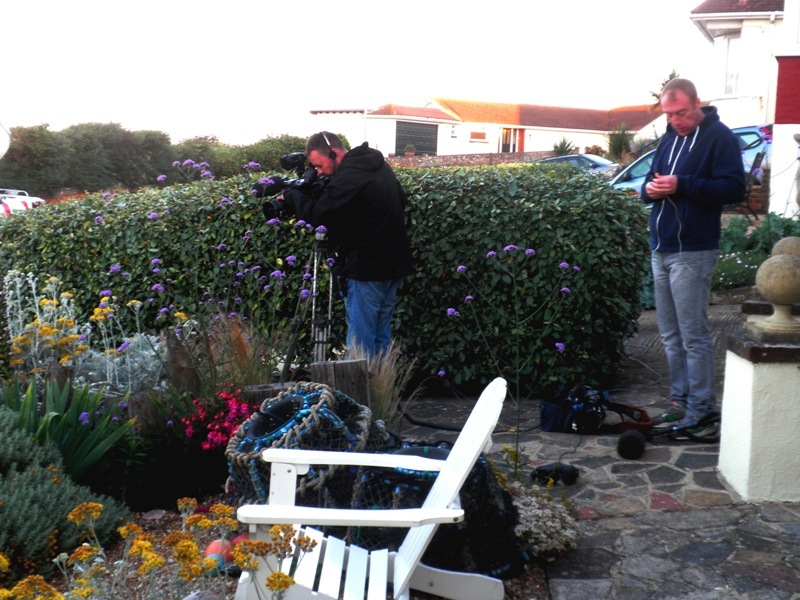 The crew followed on with a sound engineer, camera man and producer Oliver Breckon. Closely followed by Laura Tobin who came and got ready in our dining room! They were well fed with bacon rolls and mugs of coffee! 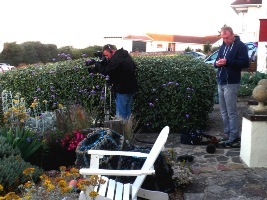 By 0530 they were all ready to go with the first opening shot done in the boat in the front garden. 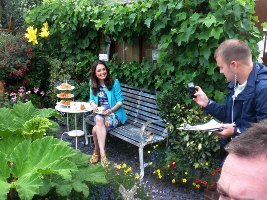 Laura sat in the boat for the filming then posed for a shot when finished. 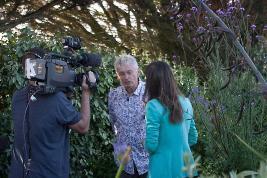 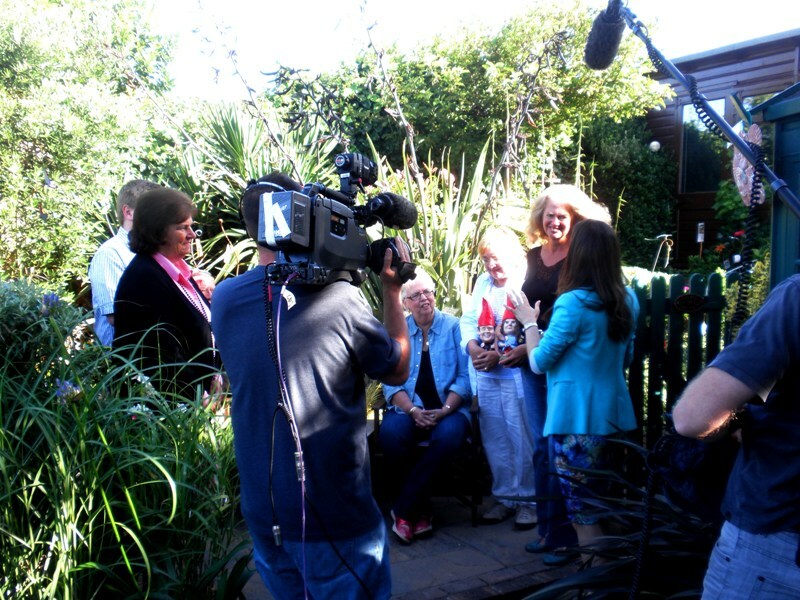 They then moved in to the back garden and completed another session before the live interview with me in the garden. 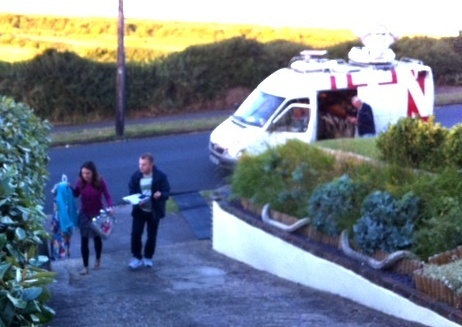 Laura spotted cakes in the kitchen and asked for some to be put out on the table for her filming. 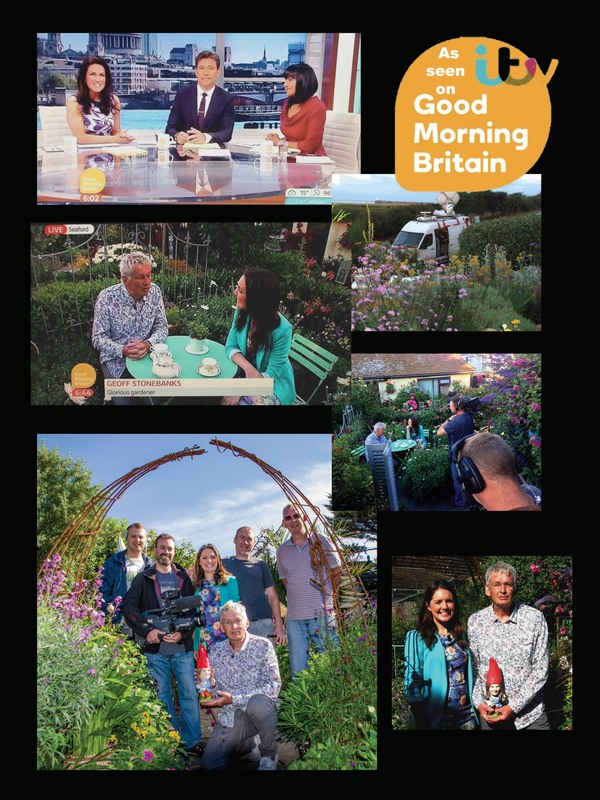 The shot in the middle is the one Oliver is taking in the first image which was sent back to London to be posted on the Good Morning Britain web site! 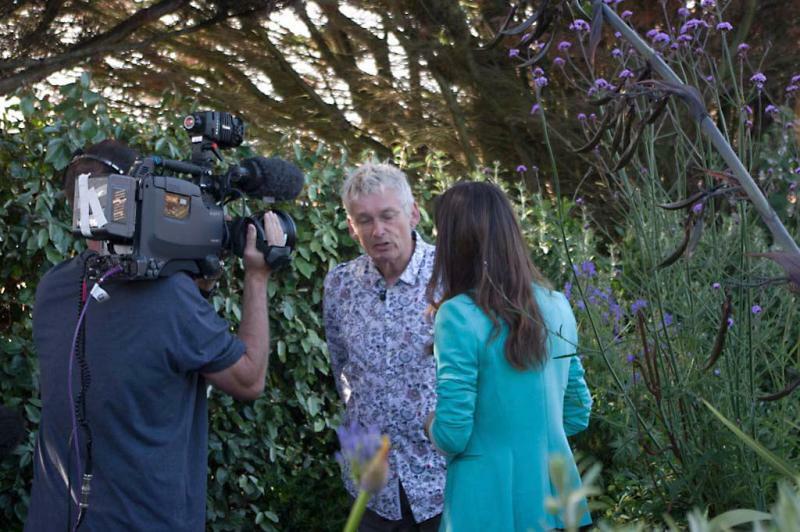 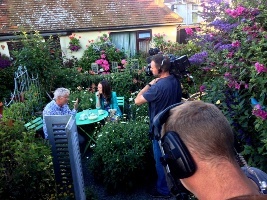 Below is the first part of the morning's broadcast from Good Morning Britain with Laura starting the programme in the front garden and looking at the back garden before talking to me in my favourite part of the garden at 0643, when she and I took tea on the green table surrounded by the shasta daisies just about to burst in to bloom. One of Laura's lead in to the weather showed her waking through the garden with me watering in the background which is in the clip below. 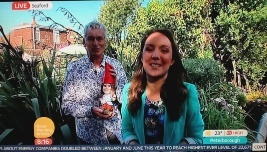 The final session at 0815 showed Laura talking to Linda Wallraven and myself before presenting me with the gnome live on air after talking to me! 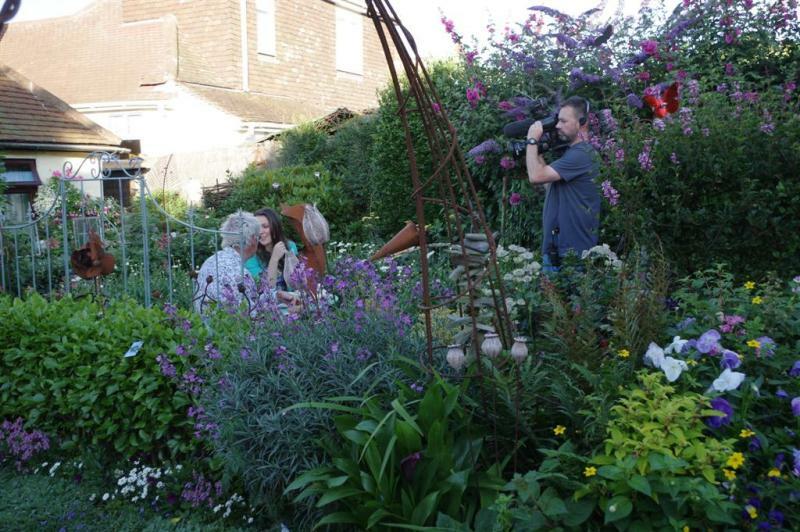 For the final shots it had been planned to include some of the guests that were in the garden, Richard Walsh, (regular helper in the kitchen when we open the garden) Linda Wallraven (ex Mayor of Seaford, who helped establish the Mayors' trail), Audrey Peters (a prolific facebook follower), Julie & Ron Basham (garden owners who open up for the Macmillan Trail) and Celia Hughes (a regular helper on the gate or in the kitchen), not to mention a friend staying for the weekend, Alan Clayton. 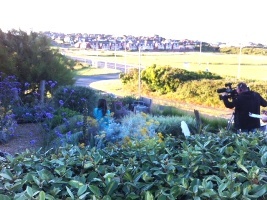 Below getting ready to film. 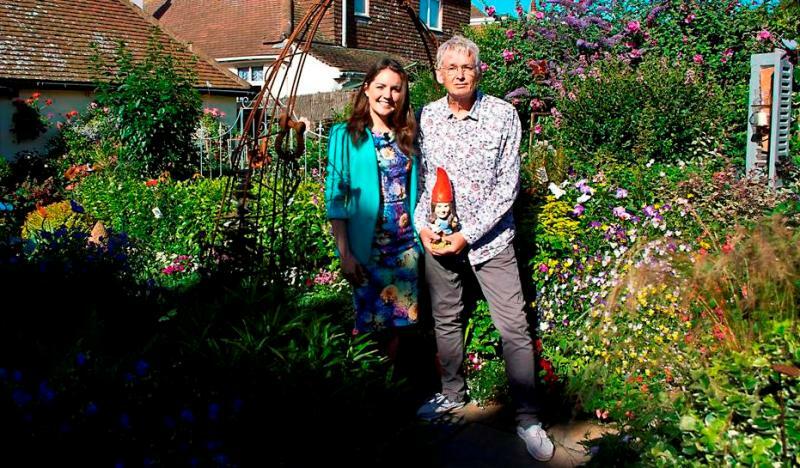 Once all the filming had been completed I was asked to talk to Laura about my 3 top tips for a video clip to be posted to the Good Morning Britain web site the following day! 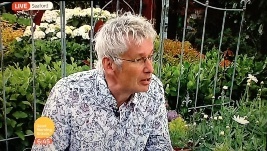 Centre image shows me doing this. Finally after the shoot was finished we took one of all the crew, Laura and myself, along with the gnome she had presented me with on air as a thank you for all the hospitality they had received! 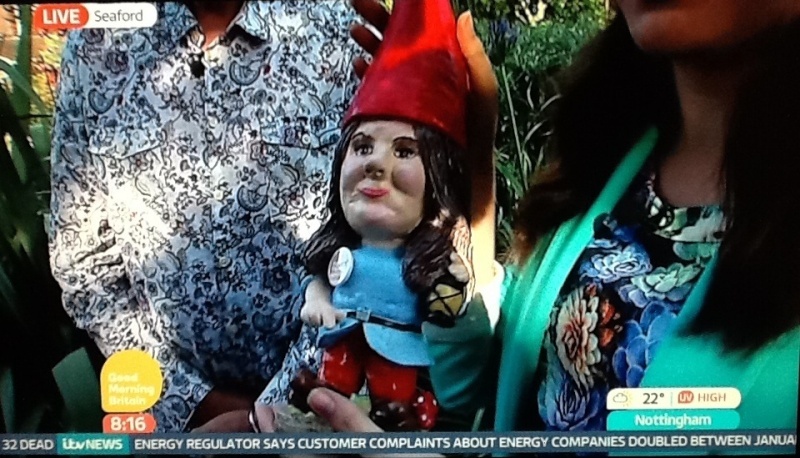 Below, Audrey had her picture taken with Laura and the group also had one taken to celebrate a great morning along with one of the gnome too. These were some great shots sent by Oliver after they had moved on to the next location! 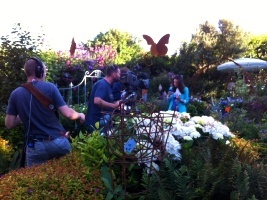 These were some still shots taken from the live footage! Laura gnome was soon found to be at home in the garden as you can see. 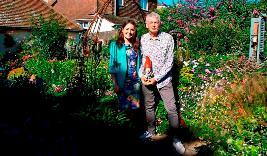 One friend, Wendy Dugdill, said after seeing the show WELL DONE!!!! 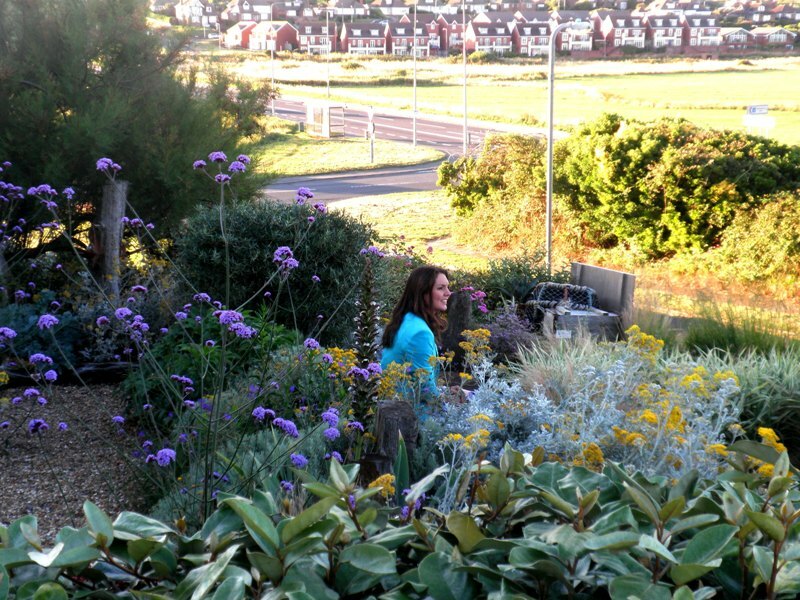 Brilliant view of your garden and hard work. 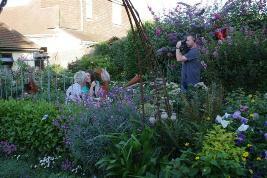 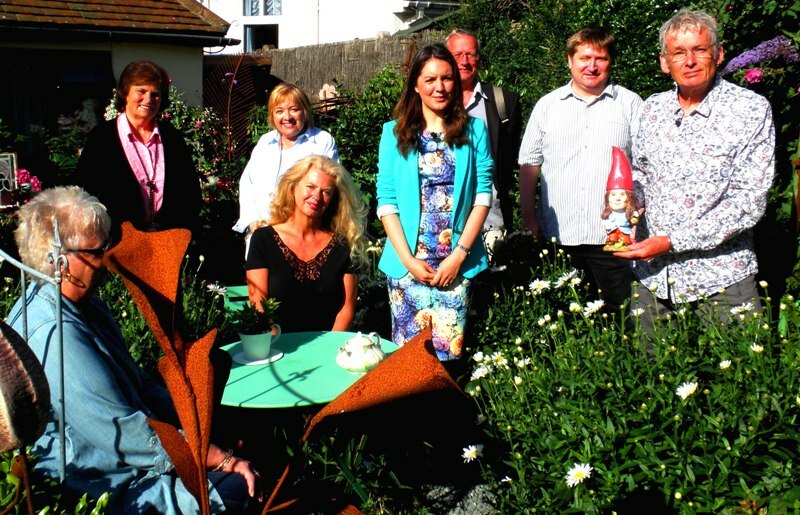 The garden looked great, but it was also such an accolade for you Geoff, with all the fund raising you've done. 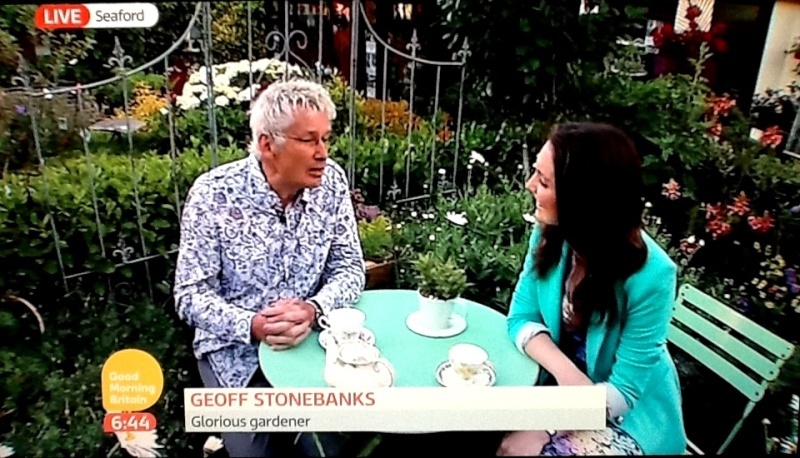 Fantastic advertising. 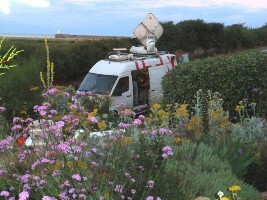 Enjoy the summer. 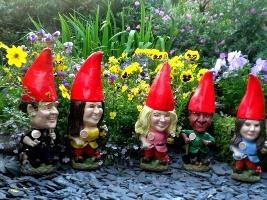 Love the gnomes!" All in all a great morning and such a wonderful crew to work with who were extremely careful about working in the garden so that they did not damage any of the plants. 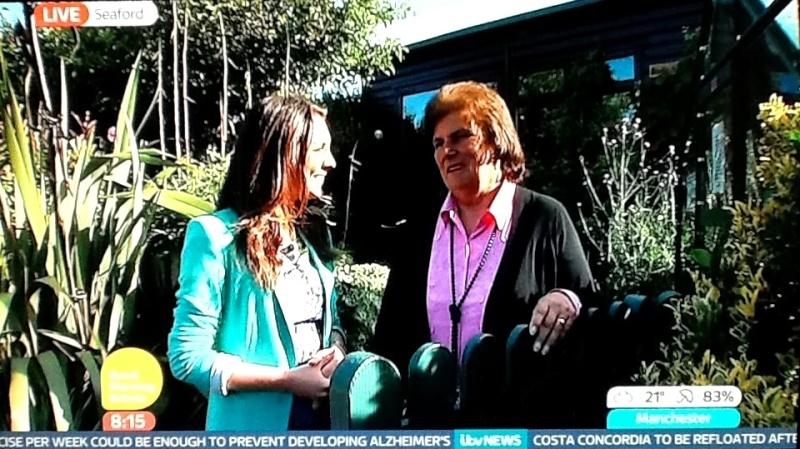 Thank you so much to ITV, Oliver Breckon and Laura Tobin! 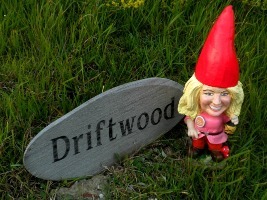 On reading the blog, Oliver said "Wonderful blog - just had a read. We all had a lovely day so thanks once more. 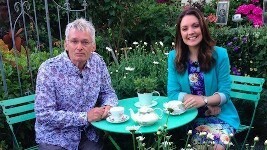 So happy you had such a good morning. 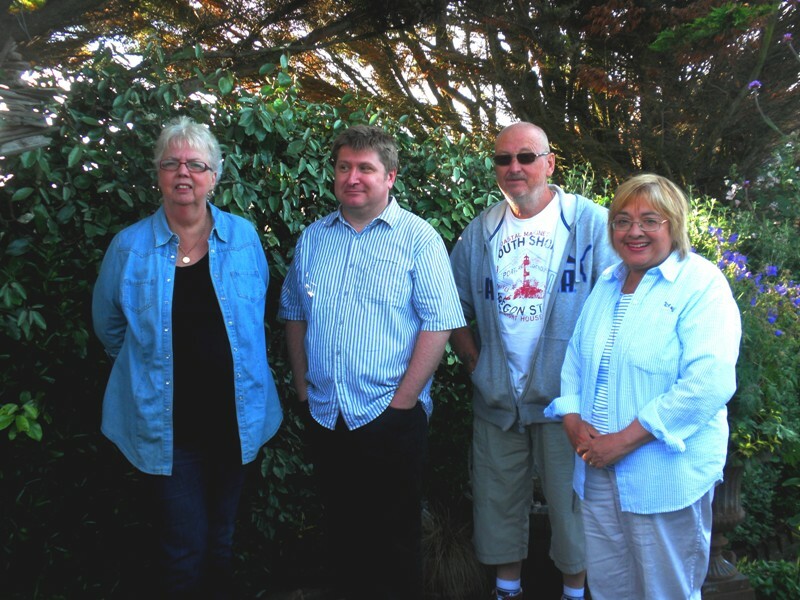 You made our job a breeze!" 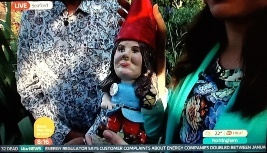 And..... 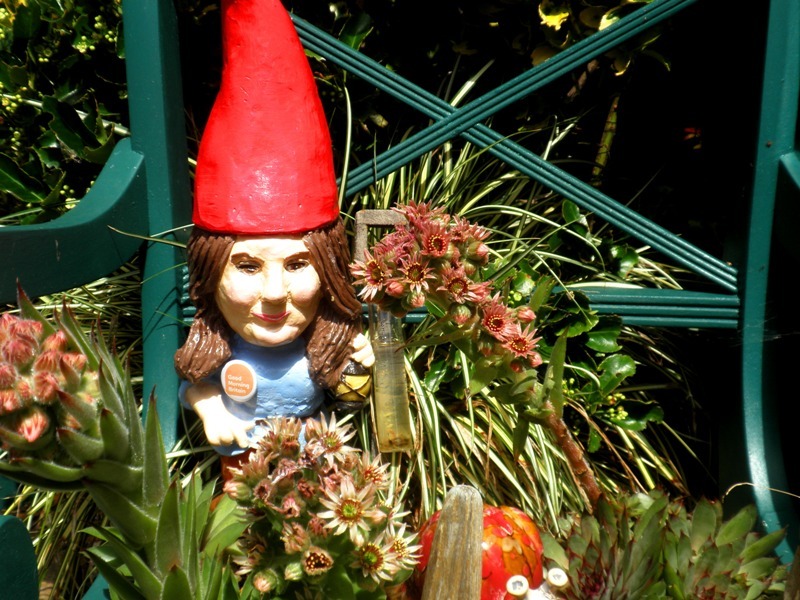 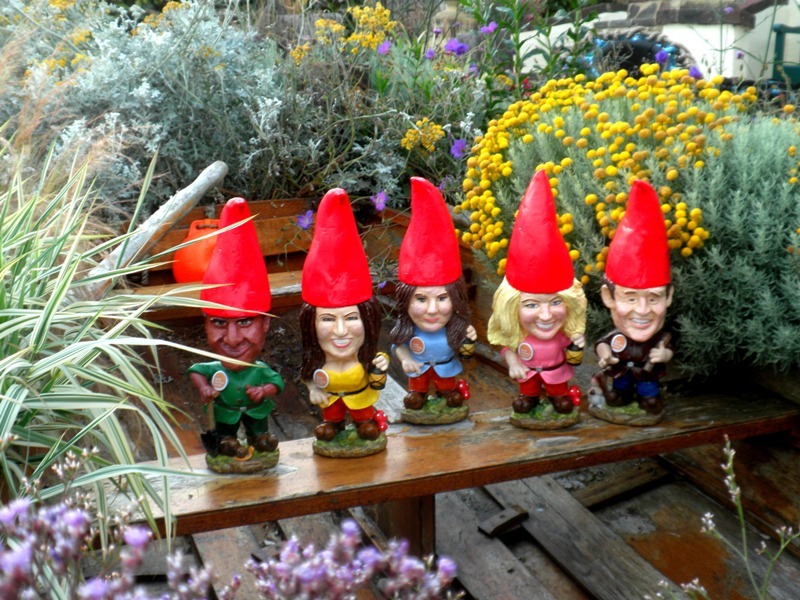 If you are interested here is the story behind the GNOMES . 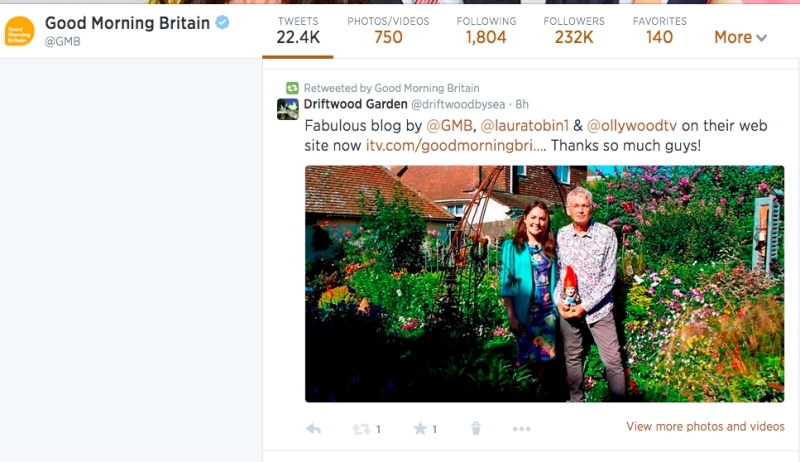 Good Morning Britain retweeted the blog tweet to it's quarter of a million followers!